Studio portrait of 164 Private John (Jack) Booth, A Company, 20th Battalion. A shipwright of Balmain, NSW, he enlisted in March 1915 and embarked on HMAT Berrima in June of that year. He was killed in action on 9 October 1917 at Passchendaele. 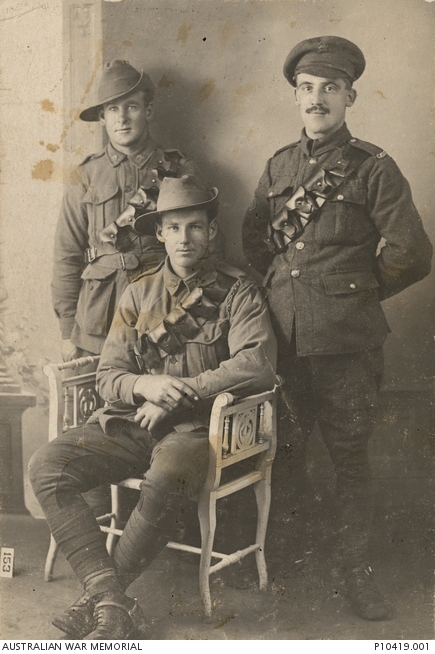 Studio portrait of 9481 Driver (Dvr) Samuel Hordern Booth, 1st Divisional Train (left), his brother 164 Private (Pte) John Booth, 20th Battalion (seated) and an unidentified soldier. 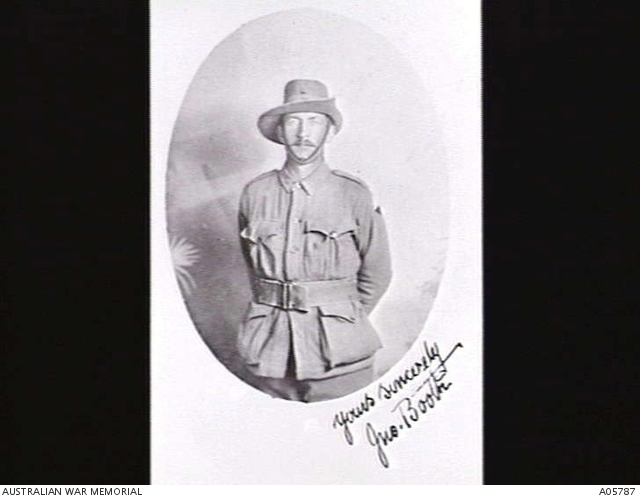 Dvr Samuel Booth, a carpenter from Balmain, NSW prior to enlistment, embarked with the 14th Reinforcements from Sydney on HMAT Ballarat on 16 February 1916. Later transferring to No 28 Company, Army Service Corps, he returned to Australia on 23 June 1919. Pte John Booth, a shipwright and also from Balmain, NSW prior to enlistment, embarked with A Company from Sydney on HMAT Berrima on 25 June 1915. Following service at Gallipoli he transferred to the 5th Machine Gun Company in France. Later returning to the 20th Battalion, he was posted as missing in action in Belgium. It was subsequently determined that he had been killed in action at Passchendaele on 9 October 1917. Having no known grave he is commemorated on the Menin Gate Memorial, Ypres, Belgium. See also A05787. 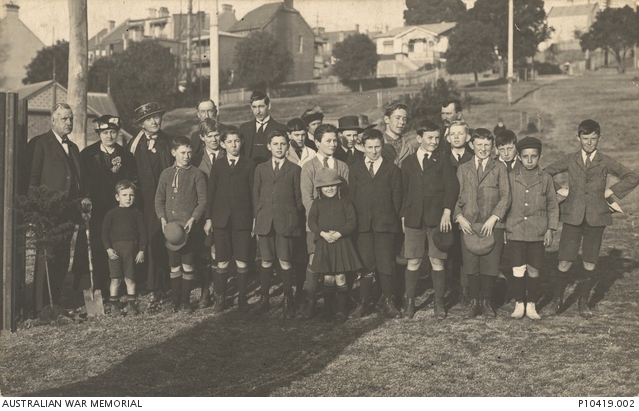 “Planting trees in Elkington Park, Balmain, on [sic] memory of John Booth who was killed in battle at Passchendaele France October 9th 1917. The Mayor of Balmain Alderman D McKenzie planting the first tree in prescence of some relatives friends and children of Brichgrove Road School. And life is colour and warmth & light, And a striving evermore for these, And he is dead who will not fight, And who dies fighting has increase.” The terraces in the background in Glassop Street, Balmain, were built by the father and grandfather of John Booth. The third person unidentified in the top photo is the brother-in-law to John and Samuel Booth – William Scott-Kemis. See info attached.